Welcome, Friends! I am going to share with you a couple things I got done in my backyard!! I am trying to spend as little money as possible on the things I do out there, so I scrounged around the yard, and the house to find things I could use for planters.I came out a winner there!! I had lots of things I could (and did) turn into planters. I did end up buying two hanging baskets, but as I found them at one of our local dollar stores, very little money was spent. 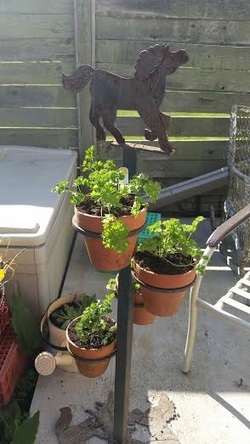 Several years ago, I found a tall metal plant stand at a yard sale. It holds four good-size terra cotta pots. 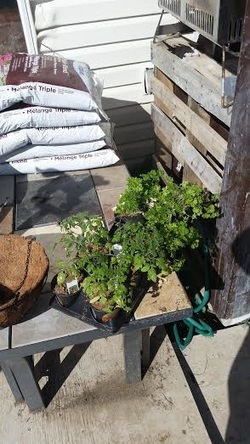 This year, I planted parsley in all four pots. I had this really cute umbrella stand that was getting in my way in the house. I had thrown out all the umbrellas and the stand was now empty. I kept moving it from room to room until finally I set it outside on the deck just to get it out of my way!! It has now been repurposed as a planter. 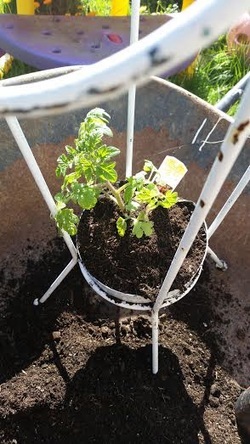 I put a cherry tomato plant in it! The two hanging baskets have been put to good use as well. One has four grape tomato plants hanging out the sides, and the other has a beautiful strawberry plant in it. 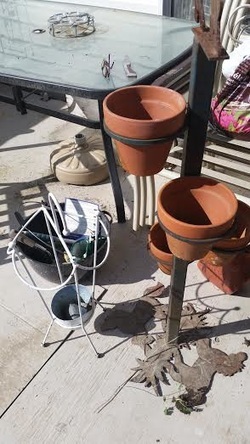 Son#2 put up the hangers that I found at the dollar store and he also helped me plant my clematis and my herb garden- those are for another post. 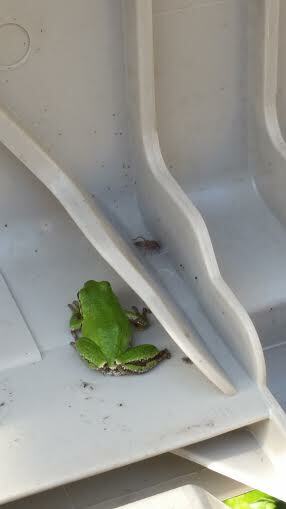 When I went to get the patio chair cushions out of the storage bin, I found this little tree frog inside! 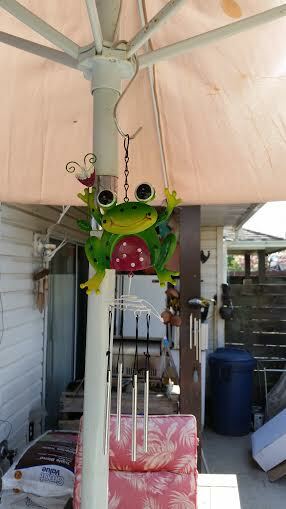 That reminded me of the wind chime my brother-in-law gave me and so I rounded him up and hung him on the patio umbrella! I have a great love for terra cotta pots and I was thrilled to find some little ones that fit into the candle holder on the patio table! Friends, It's all coming together bit by bit! The "blues" are slowly disappearing!